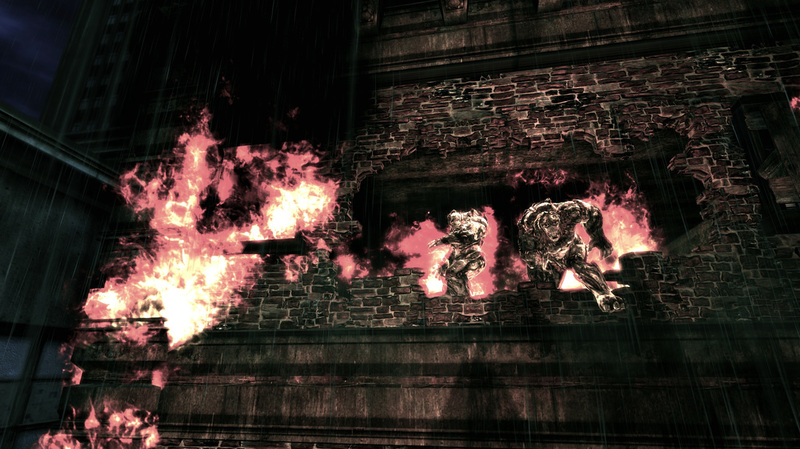 "Berserk" is a single-player Gears of War level in which players exploit environmental hazards to defeat all-powerful Berserkers. "Berserk" breathes life into the normally static environments of the Gears of War universe by offering a fresh and interesting alternative weapon to the coveted Hammer of Dawn. 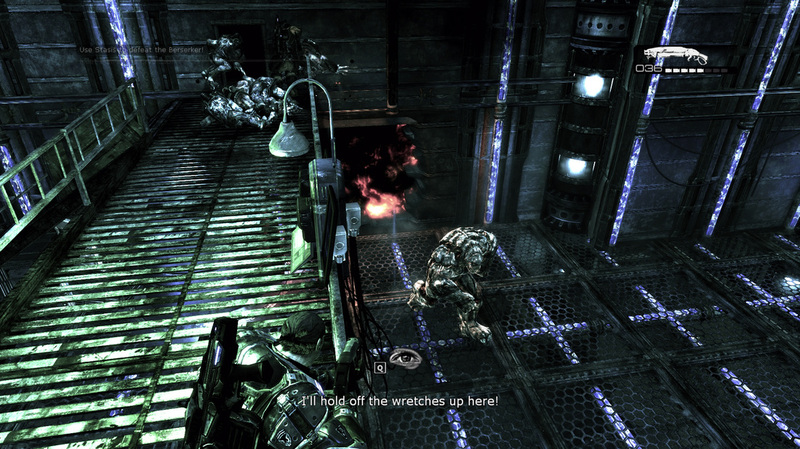 This consequential environment and its effect on the enemy injects a very cinematic feel into traditional Gears of War gameplay without removing any control from the player. The result is a fun, empowering, and fulfilling experience as players destroy power boxes to electrocute Berserkers in a flooded street, or use a stasis trap in an old cryo lab to freeze the beast in its tracks. "Berserk" takes place in the urban ruin of Ephyra between Acts II an III in the Gears of War campaign during a fierce thunderstorm. 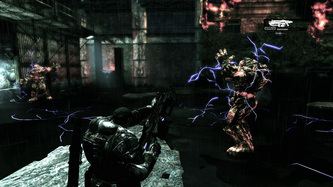 Players assume the role of Delta Squad's Marcus Fenix. After Delta's Junker vehicle breaks down en route to the mining facility, Marcus is left to defend the Junker as the rest of the team scavenges for repair parts. "Berserk" begins when Dominic Santiago runs into trouble in an abandoned cryo lab and radios Marcus for backup. Berserker Bosses: I find the Berserker to be one of the most terrifying adversaries in Gears of War. I wanted to create encounters that granted players fresh and empowering alternatives to the Hammer of Dawn. I realized this using two custom scripted hazards: destructible generators that electrify water in a flooded street and a cryo lab freeze trap. Boss Cinematic: I wanted to capitalize on the power of Unreal's Matinee tool and create a gripping boss entrance cinematic of professional quality that not only motivates players with the loss of a close ally, but also conveys the mechanics of an unconventional boss fight in an entirely implicit manner, avoiding the need for direct and verbal instruction. Atmosphere: "Berserk" takes place at night in the urban ruin of Ephyra during a fierce thunderstorm. I wanted to place players in an immersive and dynamic atmosphere that conveyed urgency and danger. 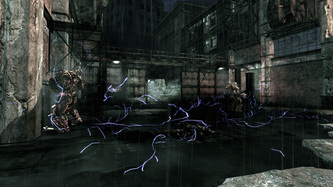 Wet surfaces emphasize the strength of the storm, while periodic lightning strikes foreshadow the electrocution of the final boss battle. Accessibility: "Berserk" features fully functional checkpoints so players never have to worry about losing significant portions of progress. "Berserk" also conveys the mechanics of its two unconventional boss battles. Dominic directs players in a more explicit manner for the cryo lab encounter, while the final fight empowers players with a gripping cinematic that implies the objectives of that battle. Reuse Space: I wanted to achieve 10 minutes of gameplay and create a level of professional visual polish. Under my time constraints, I could not achieve my desired level of visual polish in a geometrically large playspace. I had to reuse geometry in interesting ways for multiple encounters to achieve my gameplay and visual goals. This is most evident during the initial street encounters. 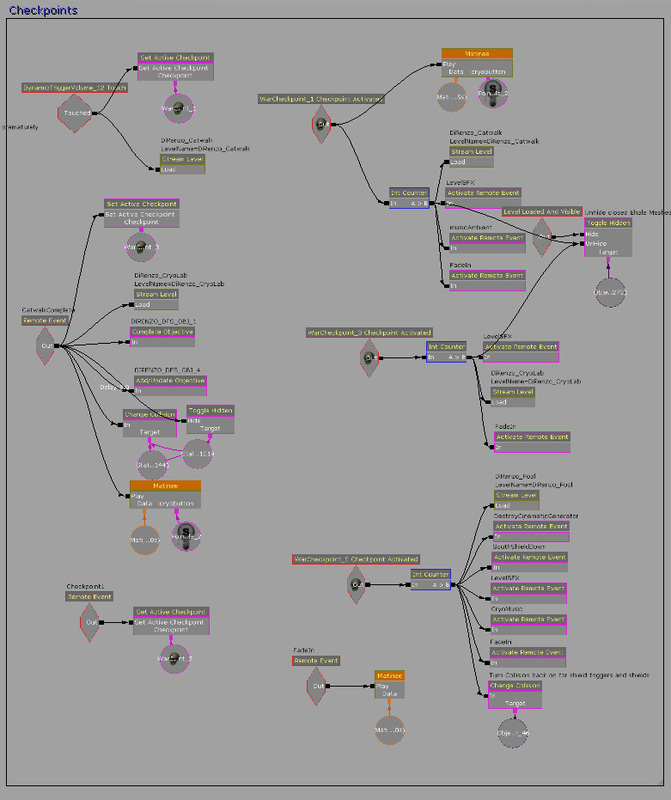 This section contains a gallery walkthrough detailing Kismet scripting highlights of "Berserk". Refer to the image captions at the bottom for a walkthrough. Use the thumbnails at the bottom to navigate and click on each image to view it in high resolution. "Berserk" features a gripping cinematic that introduces the final boss, implicitly teaches players about the electrocution mechanic, and motivates players with the death of a close ally. "Berserk's" final boss encounter features two Berserkers and takes place in a flooded street. This encounter features a new custom mechanic, power box electrocution. Players must bait the Berserkers into charging the shielded boxes. 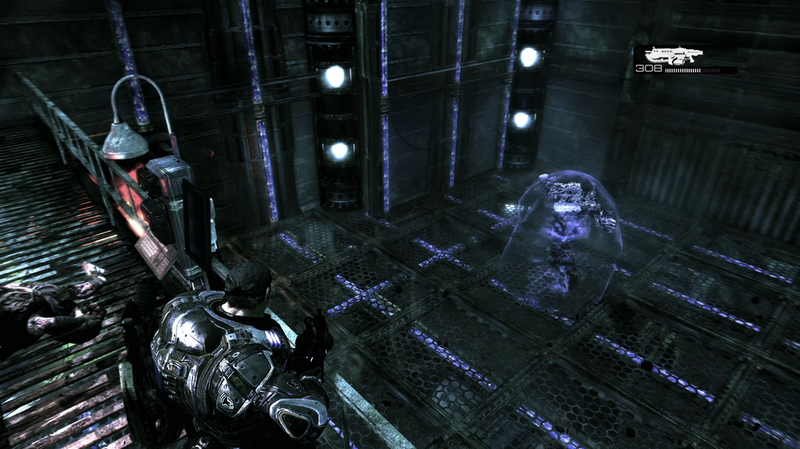 Once the Berserker charges knock the shields down, players can destroy the boxes, electrocuting the water around them. If players don't make their way to one of the three elevated areas in time, they too, will sustain electricity damage. "Berserk's" first Berserker encounter takes place in an abandoned cryo lab. 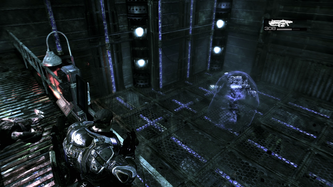 Players must use a stasis trap from a catwalk above to freeze the Berserker and shoot her before she thaws. Then they must venture into harms way on the floor below to reset the trap for use again. As players inflict more damage, Wretches enter from the ground level and increase tension and difficulty. 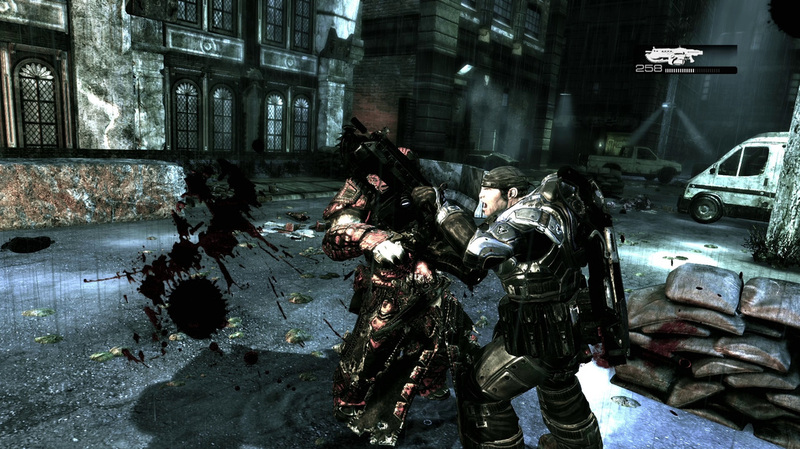 An encounter with two Berserkers in the same playable space was new territory for the original Gears of War campaign. Unsurprisingly, spawning two Berserkers in the same playspace caused them to sometimes get stuck together, repeatedly charging and colliding with one another. This removed some of the urgency and fear from the encounter as players had no reason to fear for their lives while Berserkers were caught up on one another. It also made the encounter more frustrating as players needed to bait Berserkers into charging the power box shields in order to destroy them. To fix this, I attached a volume to one of the Berserkers. Each time the other Berserker touches this volume, one of the two Berserkers is randomly chosen to charge in one of four random corners of the flooded street, separating the Berserkers before they can get stuck on one another. The Berserker that kills Dominic receives a new bloody version of its material. Because players can make this distinction if they look closely, it was important that the same Berserker was not charging away every time they made contact. I wanted to use a pawn for Dominic's cinematic role as I had for the Berserkers to eliminate the need for manual skeletal mesh movement and challenge of animation blending. Simply commanding pawns to do things had always been the much more efficient option in the past. However, killing Dom's pawn presented some issues. Firstly, as Marcus's ally, Dom's survival is crucial to succeeding in Gears of War missions. When Dom dies, players fail the mission and restart at the most recent checkpoint. I did some digging and found an alternate way of spawning pawns from what I had learned. I discovered the 'Actor Factory Ex' Kismet node and learned that it offered AI class alternatives to the familiar 'AI Factory' method. 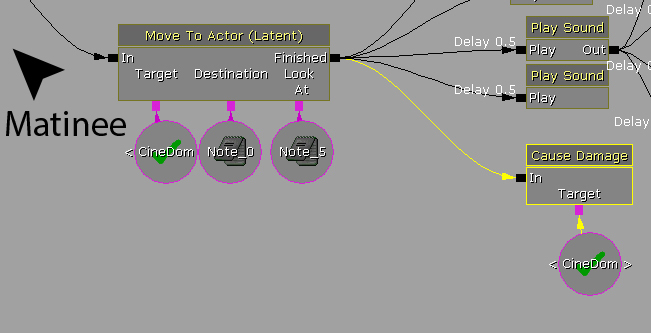 'Actor Factory Ex' allows designers to spawn a pawn and specify a different AI Controller Class from the pawn's default. I found that multiplayer variant of Dom's pawn that is used in competitive matches did not cause mission failure on death. I still needed Dom to ragdoll on death for my cinematic but no matter how much damage I or any Berserker caused him, he would simply fall down to his injured "wait for revival" state from which he became completely unaffected by Berserker attacks. I started experimenting with changing the AI Controller class from Dom's AI to other options. I found that if I used the default AI Controller, Dom, would indeed react to Berserker charges and ragdoll on death, but only from his downed state. I had to ensure that Dom was down when the Berserker made contact or else he would not ragdoll and die. 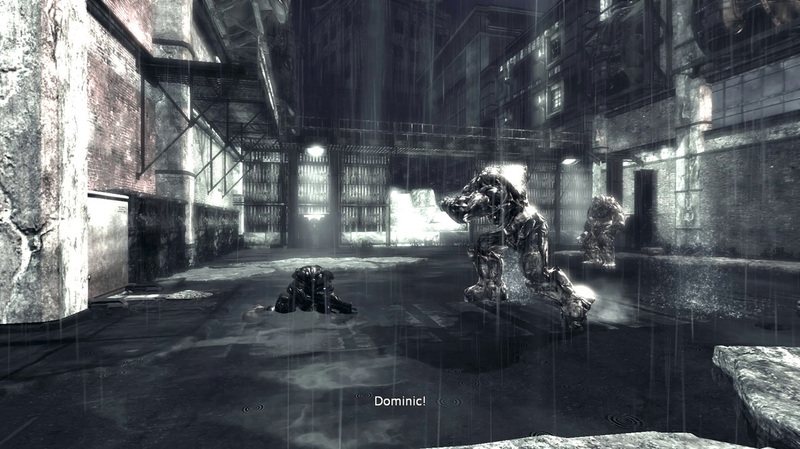 During the cinematic I command Dom to move towards Marcus. When he crosses the Berserker's path I use 'Cause Damage' to knock him down to allow for his ragdoll death, giving the appearance tripping and falling before he can make it to Marcus. 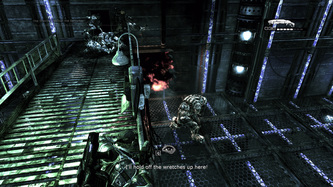 "Berserk" features fully functional and regular checkpoints as any other level that shipped with the Gears of War would. In order to achieve this, I divided "Berserk" into 7 level streams and one persistent level that is always loaded. Reloading a level stream on checkpoint activation properly resets all of its events. 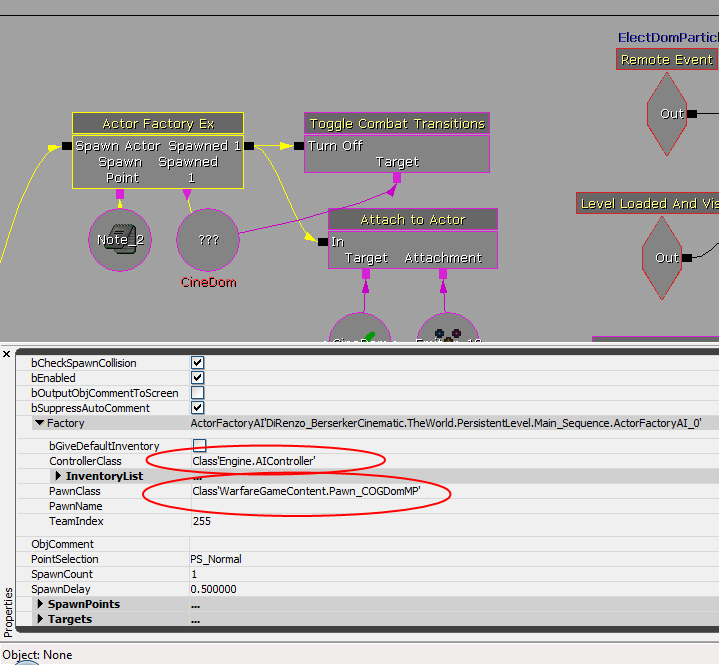 All necessary persistent level objects and variables also reset on checkpoint load with a few additional actions. 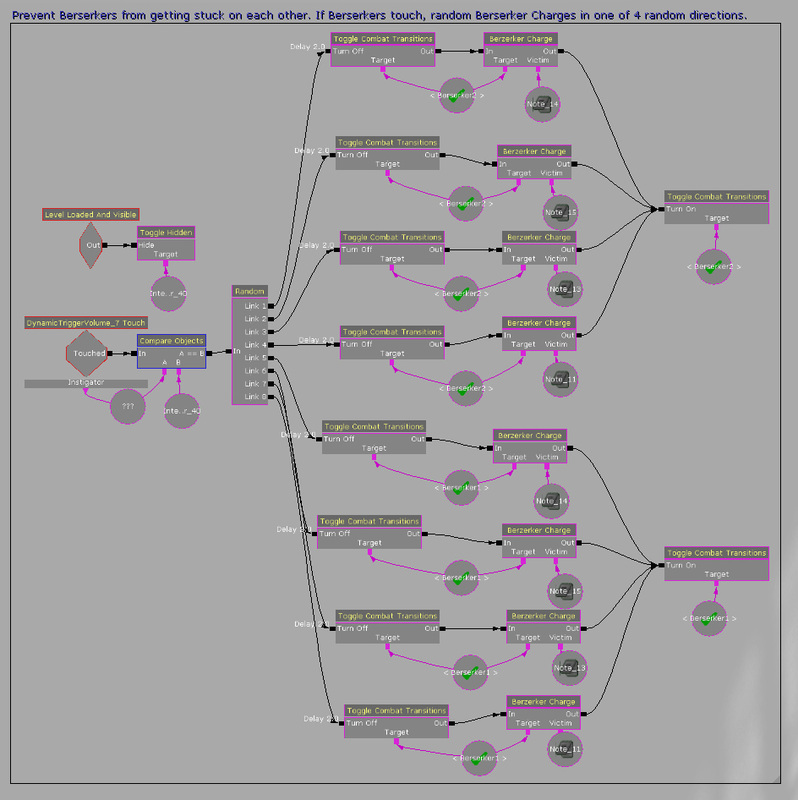 "Berserk" features many custom modified assets to achieve its visual goals. There are no existing Gears of War assets for a frozen ice mesh or explosion particle. I modified an existing water material to achieve a more static and luminescent material appropriate for ice. 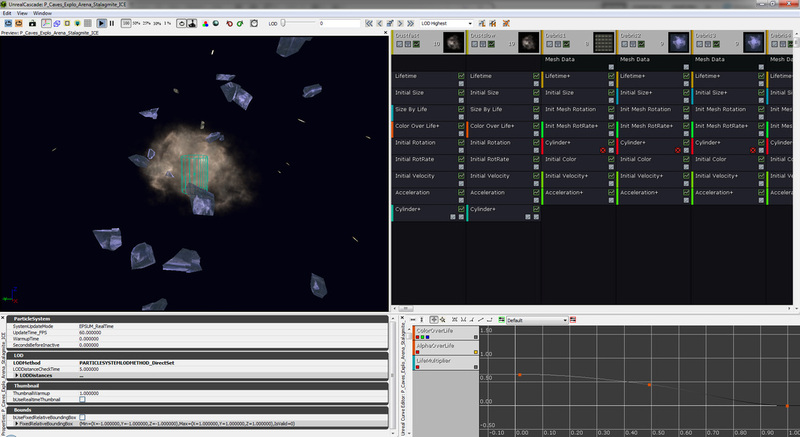 I learned to use Unreal's Cascade particle editor for the first time to apply this new material to a rock explosion and modify other particles to better suit my needs. For example, the electrocution particles initially included a smoke effect with much longer lifetime. I decreased this lifetime to improve visibility. Some folks in the Gears of War community stumbled across Berserk and made a thread about it.